The image below made me laugh out loud… I found it whilst browsing at XKCD a cool website: a webcomic of romance, sarcasm, math, and language… with really cool cartoons by Randall Munroe. 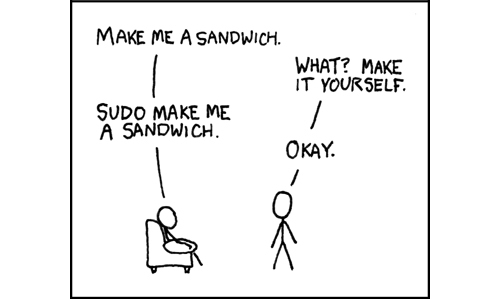 Some Randall randomness: What does XKCD stand for? It’s not actually an acronym. It’s just a word with no phonetic pronunciation — a treasured and carefully-guarded point in the space of four-character strings. Who are you? I’m just this guy, you know? I’m a CNU graduate with a degree in physics. Before starting xkcd, I worked on robots at NASA’s Langley Research Center in Virginia. As of June 2007 I live in Massachusetts. In my spare time I climb things, open strange doors, and go to goth clubs dressed as a frat guy so I can stand around and look terribly uncomfortable. At frat parties I do the same thing, but the other way around. How do I write “xkcd”? There’s nothing in Strunk and White about this. For those of us pedantic enough to want a rule, here it is: The preferred form is “xkcd”, all lower-case. In formal contexts where a lowercase word shouldn’t start a sentence, “XKCD” is an okay alternative. “Xkcd” is frowned upon. XKCD updates without fail every Monday, Wednesday and Friday.